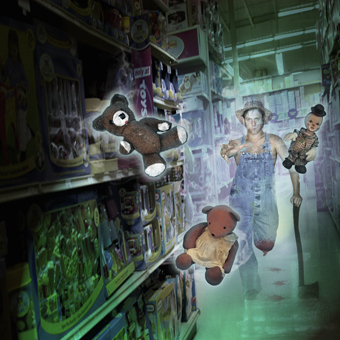 On El Camino in Sunnyvale there is a haunted Toys 'R' Us store. The story goes that many decades ago when the whole Bay Area was still orchards, there was a worker on a farm who was in love with the orchard owner's daughter. It is not known whether she loved him back or not, but one day he was told that it could never work out between them. He went into the field and started chopping wood to relieve his frustration, but in his fury he wasn't paying attention and the axe missed the log and went into his leg. He bled to death by the woodpile.